Opening Times: There are no official public opening times but nobody is likely to object to casual use as long as runners remain on the track, and do not conduct themselves in a manner likely to upset any rugby players or users of the rugby club. Regular users are however asked to phone or write to Mr. Philip Saywood, Secretary Exmouth Harriers AAC, 70 King Arthurs Road, EXETER, EX4 9ED for general availability. Club times (Apr-Sep only) Tue & Thu 1845-1945. Charges: None for casual use but regular users are expected to be club members. Non members wishing to use the track on an occasional basis at club times may be asked to make a nominal contribution. Floodlights: There are lights on top of the stand and down the back straight but are only used for rugby purposes. 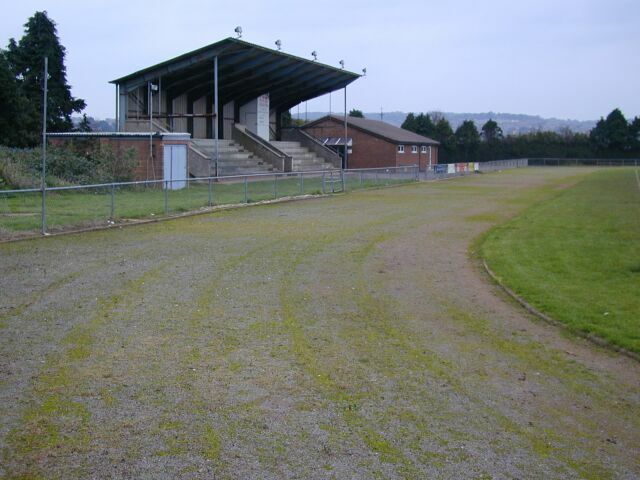 The track is around the rugby pitch of Exmouth RFC and is in fair condition. The ground is owned by the Town Council but the rugby club has a long term lease on it with the exception of the track. Exmouth Harriers AAC rent the track for a peppercorn rent but are required to keep it maintained. The track is only given lane markings for a short period in the summer to facilitate the local school's sports day but even in winter there are faint markings. There is an old sign at the track saying that users should pay at the nearby Exmouth Sports Centre but these charges no longer apply. There used to be jumping pits and a steeplechase water jump but they have been grassed over.